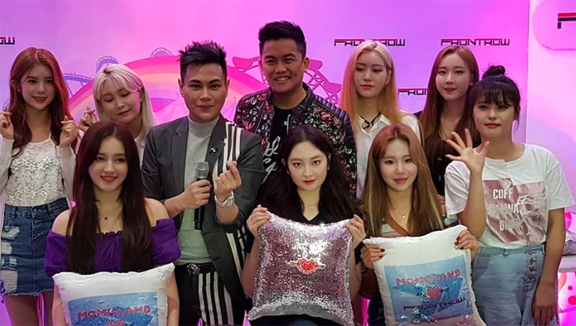 Korean pop group Momoland returned to Manila for an exclusive fan meet by local multi-level marketing company, Frontrow International. Frontrow executives with the members of the K-Pop group Momoland. In a press conference held on Monday, Frontrow president RS Francisco said that they invited the members of the popular group to be the new faces of the company, and their visit to Manila as the company’s way to express its gratitude to loyal Frontrow distributors as well as to the Filipino Merries (the group’s official fan club name). This is the second time the girls visited the country. Momoland first visited the country in August for a private event, and will return for another fan meet in January. Apart from the intimate event on Monday, the “Bboom Bboom” and “Baam!” hitmakers are also set to perform in Vigan City, Ilocos Sur on Saturday.